BAYADA President and Founder Mark Baiada and BAYADA Director Ann Baiada are joined by NJ Senator Diane Allen, Moorestown Mayor Victoria Napolitano, and Moorestown community and business leaders for a pre-construction tour of the company’s new headquarters in the historic John Buzby house at 1 West Main Street in Moorestown. 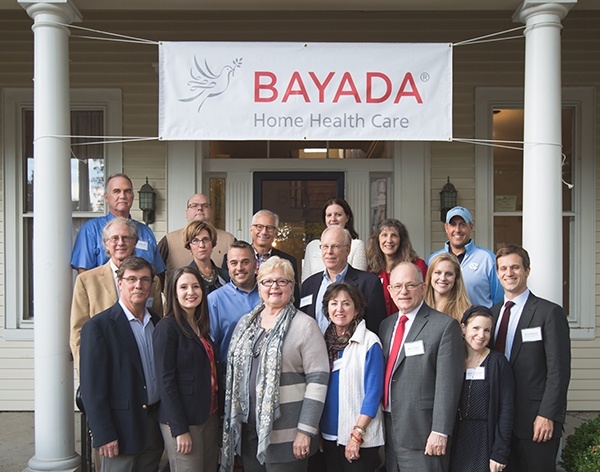 In 1982, BAYADA Home Health Care President Mark Baiada moved the company’s headquarters from Philadelphia to Moorestown, a quaint, picturesque community in southern New Jersey. Over the years, even as the company has grown from one office in 1975 to nearly 300 offices in 21 states, the headquarters remained in a small, unassuming office. Now, Mark and BAYADA Director Ann Baiada are thrilled to call a historic property in the heart of the town’s thriving and charismatic Main Street home for the new headquarters office.